This work reports the implementation and evaluation of a platform for visualising GSR (Galvanic Skin Response) sensor data from audiences. 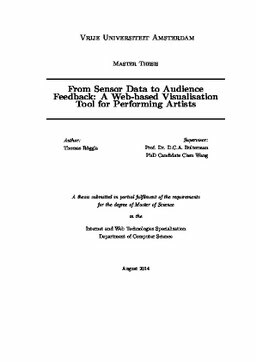 This platform is especially tar- geted at performing artists to provide them with a way to gain deeper insight into how audiences perceive their performances by combining the sensor data with video record- ings and traditional ratings. To this end, this document provides a short overview of the current state of the art on physiological computing and GSR sensors. Then it outlines the requirements for such a platform as gathered with the help of potential end users. A major part of this work provides a thorough insight into the back-end and front-end of the final product. This final product is then evaluated with the help of potential end users with methods coming from academic research and publicly available products to assess the quality and helpfulness of it. In the results, the testers perceived the idea of the platform well, but also some issues emerged. These were mostly concerned with some visualisations not being approachable enough at first sight. Moreover, the way the evaluation procedure was structured was not optimal. Finally, some issues with the platform in general are pointed out and ideas for future developments are given. Röggla, T. (2014, August). From Sensor Data to Audience Feedback: A Web-based Visualisation Tool for Performing Artists. Vrije Universiteit Amsterdam.